Tickle their taste buds with a taste from Snackers Heaven Gift Set. 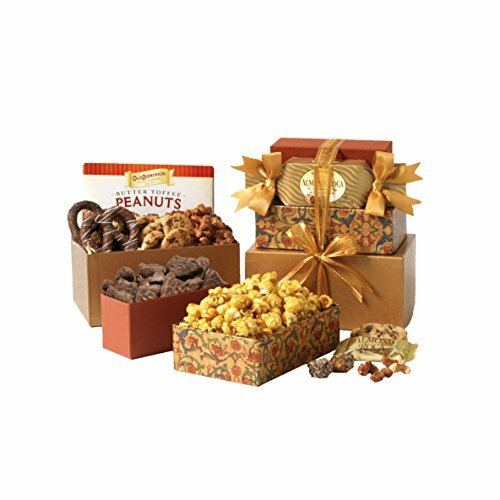 This three-tiered gift set comes with a gift box of yogurt covered pretzels, Almond Roca buttercrunch toffee, gourmet triple play popcorn, chocolate chip cappuccino cookies and Old Dominion peanut crunch! A beautiful gift that fits your budget. Any Occasion Gourmet Gift Tower offers a Sweet and Savory Selection of Five Delightful Snacks, including: Brown & Haley Almond Roca Butter Crunch, Yogurt Covered Pretzels, Chocolate Chip Cappuccino Cookies, Gourmet Triple Play Popcorn, and Old Dominion Peanut Crunch. Tasteful Reusable Packaging - Three Tiers of Sturdy Designer Gift Boxes are beautifully balanced in use of stackable shapes and clean, attractive designs. Perfectly created to be the ideal gift basket for every occasion and every taste. Perfect as an anniversary basket for couples, a congratulations gift basket, college care package, or a corporate gift basket. Ideal as a housewarming gift basket and for retirement gifts as well. This tower of treats can be adapted to nearly every need: birthday gifts, kosher shiva gifts, get well soon gifts, and any occasion! Gift Box Set Dimensions - 7 in. x 5 in. x 10 in (total stacked height) This gift set is an attractive addition to any occasion and can stand on its own without taking the spotlight from the recipient's special day.